CHARLESTON, S.C. — One by one they looked to the screen in a corner of the courtroom Friday, into the expressionless face of the young white man charged with making them motherless, snuffing out the life of a promising son, taking away a loving wife for good, bringing a grandmother’s life to a horrific end. And they answered him with: forgiveness. The occasion was a bond hearing, the first court appearance of the accused killer, Dylann Storm Roof, for the murders, apparently racially motivated, of nine black men and women in a Bible study session at Emanuel African Methodist Episcopal Church on Wednesday night. But it was as if the Bible study had never ended, as one after another, victims’ family members offered lessons in forgiveness, testaments to a faith that is not compromised by violence or grief. They urged him to repent, confess his sins, and turn to God. “We welcomed you Wed-nesday night in our Bible study with open arms,” said Felicia Sanders, the mother of 26-year old Tywanza Sanders, a poet who died after trying to save his aunt. Roof seemed to show no emotion as family members spoke, showing their anger, sadness and even forgiveness. The statements offered a moment of grace in a day when new details emerged about a massacre that has stunned the nation, echoing a long history of racial violence. 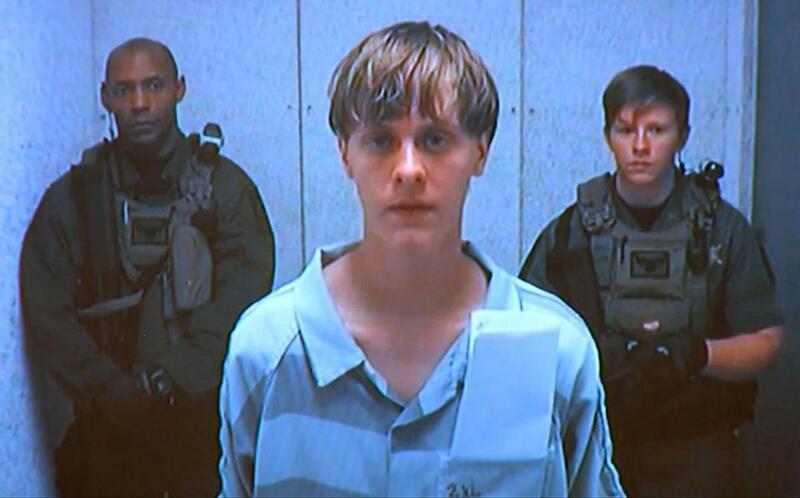 Dylann Storm Roof appeared by closed-circuit television. After the police released security camera images of the suspect outside the church, Roof’s father and an uncle contacted Charleston police and positively identified the defendant and his vehicle as those they saw in the photographs, the warrant revealed. “Defendant’s father told investigators that his son owns a .45-caliber handgun,” the warrant said, the same caliber shell casings that the police had recovered from the church floor. Roof, 21, who is white, was charged Friday with nine counts of murder, punishable by death, and one count of criminal possession of a firearm during the commission of a violent crime. Law enforcement officials said that after he was arrested Thursday in Shelby, N.C., he told investigators he had just done something big in Charleston, and the pistol believed to have been used in the shooting was recovered from his car. The killings, which were quickly called a hate crime, helped fuel a renewed debate over whether the state should continue to fly the Confederate battle flag outside the state house in Columbia. Friends said Roof voiced virulently racist views and had talked recently about starting a new civil war — even about shooting black people. Photos of him wearing patches with the flags of the former white supremacist governments of South Africa and Rhodesia, and leaning against a car with “Confederate States of America” on its license plate, drew millions of views online. Governor Nikki Haley, a Republican, was one of many officials to call the shootings a hate crime, and called for the death penalty in the case. The flag will be debated in due time, Haley said, but that issue must wait until after a period of grieving. President Obama, a day after lamenting the poor prospects for new gun control, said his words had been misinterpreted as resignation that nothing would change, and renewed his call for legislation. The Justice Department, which was already looking into the possibility of a hate crime prosecution, said Friday that it had not ruled out the possibility of calling the case an act of domestic terrorism. To Cornell William Brooks, the NAACP president, who spoke in Charleston, there was no doubt. “This was an act of racial terrorism,” he said, adding that police and prosecutors should determine whether Roof had ties to any hate groups. Thousands of Charleston residents filled TD Arena at the College of Charleston for an evening prayer vigil, suffused with expressions of Christian faith, the history of slavery and civil rights in the city and the state, and a collective resolve to find some meaning in Roof’s actions. The crowd was a multicultural mix of residents that included families with small children and old people who needed canes. “We all have one thing in common. Our hearts are broken,” said the longtime Charleston mayor, Joseph Riley Jr., who received a standing ovation when another speaker recalled his protest to remove the Confederate battle flag from the state Capitol grounds in Columbia. 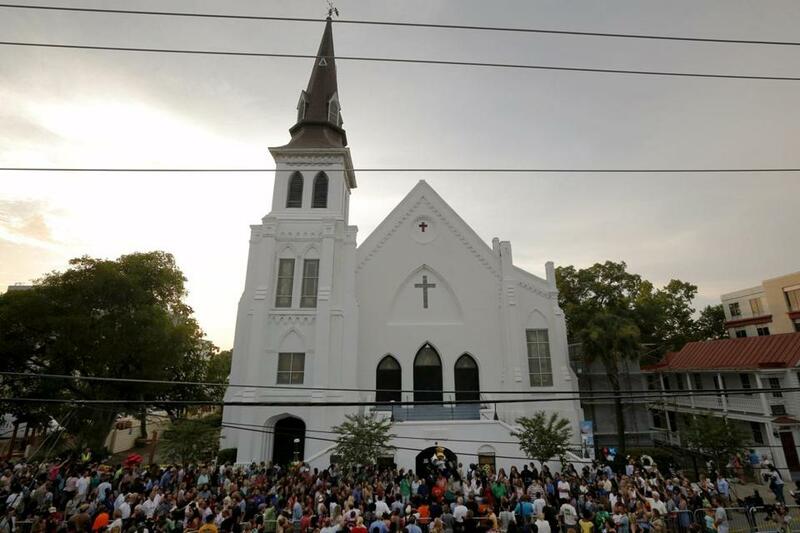 A crowd gathered outside the Emanuel AME Church following a prayer vigil nearby. Magistrate Judge James B. Gosnell Jr. set Roof’s bail at $1 million on the gun charge, but explained he did not have the authority to set bail on the murder charges, which would be handled by the state’s Circuit Court. 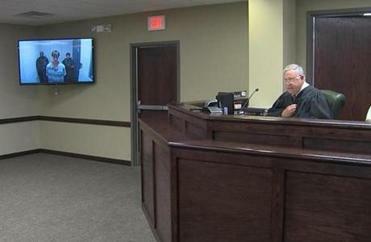 The defendant watched impassively on a video link from a nearby jail. The judge drew mixed reactions for another statement from the bench, when he stated Roof’s family were also victims in the case. The family released a statement Friday saying, “words cannot express our shock, grief, and disbelief as to what happened that night,” but gave no insight into the defendant’s state of mind or racial views.